The right or the wrong way ??? What about the best way ? It starts with good seed. Good seed is seed that after harvesting did become at least 3 weeks to dry. After that they need to be in a temperature of around 0 degrees Celsius for at least 2-3 weeks. First then you have seed that will germinate easy. Hold the cotton under just tabwater. Then you push with one hand the water out. Then open the cotton and use halve of the space to put your seed. So... then close the cotton. Over the kitchen folie you wrap it in 1 or 2 layers alluminium folie. Give them a place at 23 degrees celsius for exact 31 hour. By 20 degrees you need 33-34 hours. THEN it's time to move them on because 70-80% will be open already. All seeds that become a longer root then just the little point in the beginning...will not be happy by spending that energy for nothing. The little placenta in the seed only can "give" the plant untill there's synthese. So... from sprouting to a little plant with leaves who will take care for the synthese... should take as less possible time. After germinating successfully for many years of quality seeds from reputable breeders directly into my medium of choice (coco), I find germination environmental conditions to be the # 1 factor in having success with direct sowing of seeds into your grow medium. I use plastic ice cube trays with a single hole drilled in each section and filled with coco that I charge beforehand so I can add just water the first couple watering's. Once they are above the surface, 24hrs light, 80* temp, 65 to 70% humidity until a couple inch's high and then into 4" square pots. From that point on depending on the strain they get what they need in my standard veg regime. Sometimes there is one or two in a full pack that never make it out, but the way I look at that is, I never really want those plants anyhow and consider them inferior because they never saw the light of day! Well.... I understand and see some points that I do take you serious. The difference in your way and my way is that I'm sure about the germinating time from the beginning. So I'm sure that they're all growing up the same. That's giving a nice feeld where the plants all are growing in the same hight. On day 30-35 we still are "pushing" some headtops down by giving them a fracture to let them hang on the same hight then the rest. You may buy some cannabis seed for the birds in a pet shop and try what I wrote above here. That may cost like 2 or 3 $ for a kilo. I guess it may surprise you. I totally agree that the roots shouldn't be allowed to get too long. I actually started seeds friday and didn't take my own advice to start directly because I didn't have the growspace in order to start in pots. So I started in tissue paper and unfortunately didn't get around to planting them in soil before monday. By then a couple of seeds had tails that were a little too long - the "bend" on the neck of the seed that normally lifts the cotyledons, shedding the shells in the dirt, was almost straightened out. Although I had 18/18 seeds germ 2 are struggling to break dirt now because of my mistake, and it's definitely a possibility that they'll run out of energy. Now these kind of worries are only when starting with expensive seeds. If starting with seeds you've made yourself the best thing you can do is just chuck them in soil and ruthlessly kill off any seedling that won't grow strong without help. 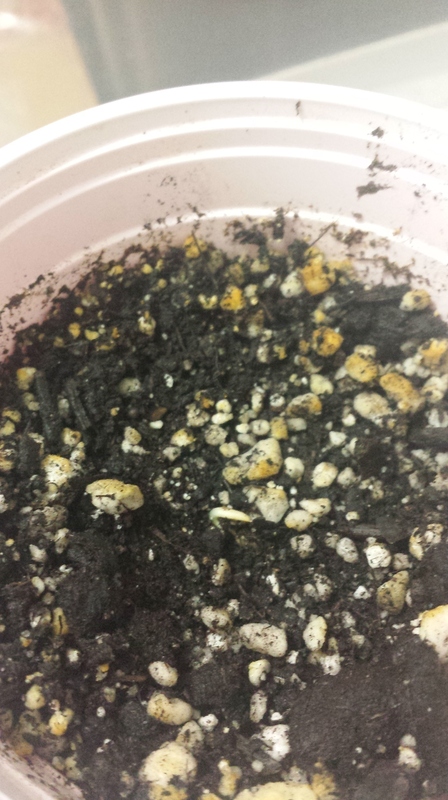 sometimes I toss them in the hole and the taproot grows in the wrong direction, this never happens w/ direct seed. I've been pollen chucking for a couple decades so always have lots of seeds I can play with so have tried almost every method of sprouting seeds and getting sprouts going fast that you can imagine. The best by far is straight into media with a few tweaks. I first scarify my seeds in a pill jar lined with 150grit sandpaper. Shake them gently holding the jar horizontally for a full 2 minutes. If you still like to soak them add a few drops of 3% peroxide to a 30ml shot glass to break up any surface oils on the seeds that may prevent water from getting in easily. A very small dab of dish soap will help as well. Handling seeds with your fingers can coat them with oils so don't do that. I use a pair of long tweezers that I put little rubber booties on with small pieces of shrink fit tubing. Bare metal tweezers can send those seeds off to where you will never find them. I used to use those 9-hole seed starter pots filled with ProMix HP screened thru a 1mm mesh screen. Same mesh as window screens so can buy it at a hardware store. 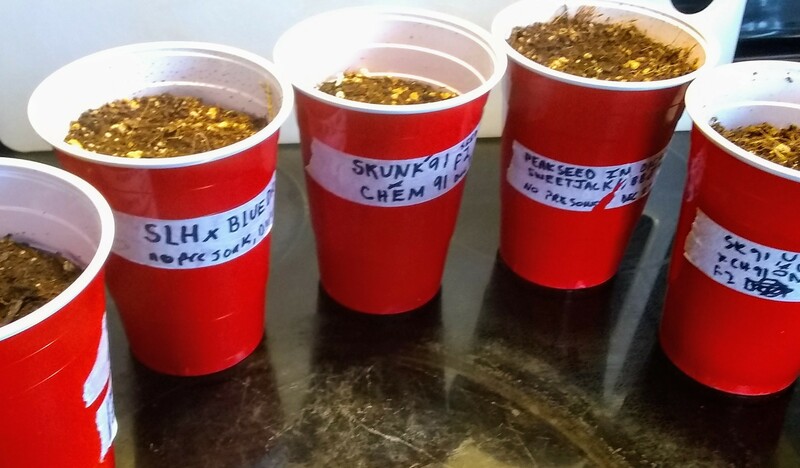 Doing a round now of 18 seeds in 3" square pots filled with a 50:50 mix of the HP and ProMix Veg&Herb that has organic nutes in it. In each pot I'll scoop out a spoonful of the mix and replace that with the screened stuff so the seed is coddled in fine particles for maximum contact about a half inch deep. IMO it really doesn't matter which direction the seed gets planted. Base side down or pointy end it's a bit of a crap shoot. Sometimes the root comes out in a straight line and other times it circles around the seed before heading down. It knows which way to go. Even ones that come out of the soil root first can be flipped over and grow fine. If you're happy with what you're doing keep doing it. There are lots of ways to skin this cat. OMFG! Get some decent smilies! Come on over to CC and rip off some of ours. Gotta get on a bit of a rant here sorry in advance. Ok here's the deal IMHO. If you are growing for production and smoke then by all means do whatever it takes to get that seed to poke through. BUT!!! If you are breeding this plant then it needs to be straight to soil or plug, and here's why. 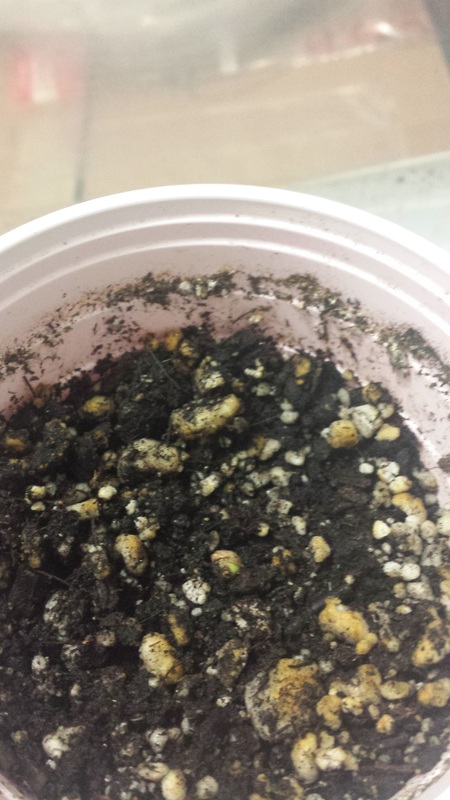 A week seedling is immediately disqualified from breeding and a poor germinating plant is also. If it's an effort to save a landrace or rare cultivar then MAYBE it's acceptable due to seed age. We need to let nature cull the bad ones or eventually seeds will simply stop germinating in general. We do not breed cattle that have issues with birthing. We do not breed dogs for the same issue as it's inhumane to the mom. We do not breed wheat or tomatoes or anything else that requires extraordinary measures to grow because we favor ease of production. By taking extraordinary measures to get these babies to sprout we are doing the plant a great disservice, and creating a life form that may one day lose it's ability to germinate all together. We should apply the same principles to the human race. If we are exempt from this, I'd love an explanation why. Because we are in an age of child worship, as George Carlin so eloquently coined it. Anything else I have to say on this topic probably belongs in the shark tank. Exactly it's a matter of viability, why waste coco, cups and nutes on a seed that might not even crack? I am with you on this, i do not wait for seeds to crack after 3 days, if they didn't do it in the first 48hrs it gets tossed, no matter what. And even with that rigorous selection at seed stage, i do get some runts once in a while. I soak them overnight or until they cracked open, and i let them in paper towels for the next day or so, or until tap root is about a half an inch long. I never ripped a root tap pulling it out of the towels and i carefully place them on the pre-charged coco coir, at which point when i see the little soldier with the helmet on, i remove the helmet. Regarding the "survival of the fittest" approach described earlier in the thread: with $10 seeds I am giving the best chance I can give them. I can't afford to dispose of the slightly weaker ones. With seeds that I have made, which I have a lot of, I'd be much more inclined to be ruthless. Based on very limited experience, I haven't had to be ruthless - the seeds I made are extremely vigorous little buggers. I haven't had to be ruthless - the seeds I made are extremely vigorous little buggers. I've had great success with a quick pre-soak,at times%100 and I've been playing around with seed depth,and find a good healthy half inch,helps to shed the seed jacket plus the light embryo (coating/membrane),as I have decapitated many potential seedlings trying to remove that, if the seed depth doesn't catch it(removed by abrasion)I've used a spray bottle to use hydraulic pressure to remove,as it's so disheartening to lose any and all seedlings,haha,I just realized how crazy this must sound, peace and love baby! I always soak mine over night then put them in coco cubes in my propergator. Which is heated but only used in the winter. I was always told to soak them as the good seeds take in water and the bad seeds won't and stay floating. It's horses for courses though. Paper towel method works fine too bit I'm clumsy and have squashed a number of seedlings doing it that way. I don't think survival of the fittest necessarily applies to seeds. Sometimes seeds have exceptionally thick hulls, and are just more difficult to germinate. If I had applied that logic to my Black Afghani seeds, I would have gotten 0/7 to germinate. Instead, I applied scarification, soaking, paper towels and even manual cracking to get them to germinate. Now I have 7 plants and all but 1 are healthy and growing rapidly. 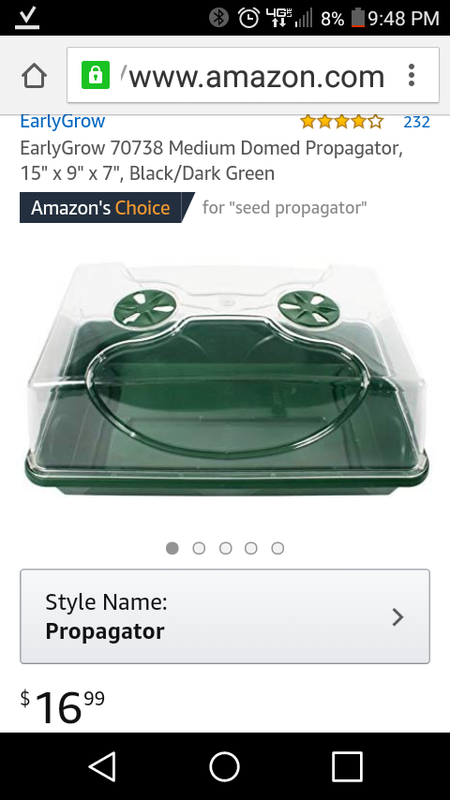 IMHO get them to germinate by any means possible, and evaluate whether to keep the plants during veg... Unless you're starting from a huge supply and money is no longer a consideration. Ease of germination does not necessarily mean a weak plant.